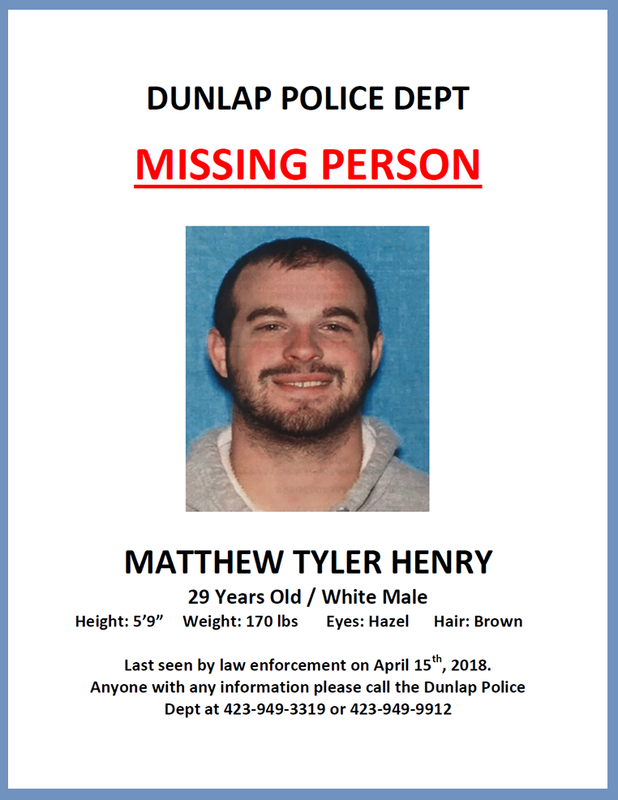 Karen House : April 15, 2019, 4:16 p.m.
April 15, 2019 – Today marks one year since Dunlap resident Matthew Henry disappeared, and the Dunlap Police Department (DPD) has not stopped looking for him. Today they are asking anyone with information about his disappearance or his whereabouts to please contact the DPD. Those conversations have led police to believe someone was responsible for Henry's disappearance, but the family still struggles with the anguish of having no idea where he is or what happened to him. They have yet to find closure. As we approach the 1-year anniversary in the disappearance of Matthew Tyler Henry, the department continues to seek any information from the public that may assist in the investigation. Matthew was last seen on Sunday, April 15th, 2018 in Dunlap. Over this past year, detectives and officers have met with over an estimated 200 individuals concerning Matt’s disappearance, with over an additional 50 individuals being formally interviewed. Investigators believe Matt is the victim of foul play, and the case is being conducted as a homicide. Agents with the FBI, TBI, and the Sequatchie County Sheriff’s Office are also included in the investigation team. Based on evidence collected through interviews, it is believed that there are individuals in Dunlap and the surrounding area that are involved, and that there are others who have specific knowledge in Matt’s disappearance. Anyone who may have information regarding Matt’s disappearance (regardless of how important you think it may be) is asked to contact Detective Robert Raber at 423-949-3319. Lastly, on behalf of the agencies involved, I wish to ask the community as a whole to continue to pray for Matt’s family in this most difficult time. Peace and comfort are desperately needed for his family and friends. Please also keep these law enforcement officers in your prayers, that God would give them wisdom and direction as they continue to investigate this disappearance.